Stayed for 2 nights at beginning and 2 nights at end of trip to Cuba. Very well located. First room a bit tired and dark- second one much better (on non-smoking floor 7). Staff very helpful and much more friendly on return than first visit. Thank you for your nice review about Saratoga hotel. We're delighted to read that you had a great time and enjoyed your stay . Also it's a pleasure for us that you've enjoyed the services and facilities provided by our gym. We will share your comment with our team who will be happy to hear it. Thank you for your nice review. We're delighted to read that you had a great time and enjoyed the ambience. Also it's a pleasure for us that you've enjoyed the rooftop pool and our personalized services. We hope you decide to visit us again soon and we will share your opinion with our team, who will be happy to hear it. The location is great, with the old city on walking distance. The hotel delivers a true 5* experience, with large rooms, confy beds, great breakfast, and friendly helpful staff. 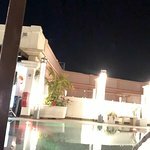 Add to that that the hotel has a rooftop swimming pool and bar with an amazing sunset view, and beautiful mezzanine bar that could be used in any movie. One of the best (or the best?) 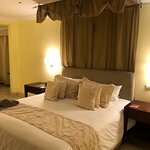 place to stay in Havana. Thank you for taking time to share this opinion! It truly does capture the highlights of your experience with us. It is a great pleasure to know that you enjoyed everything from our wonderful rooftop to the mezzanie bar and location. Thank you once again and we look forward to welcome you back. 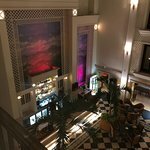 The hotel is a great location, within walking distance of the Old Havana, and it’s many bars and restaurants. The only down side was the hot water pressure/ flow taking 20 minutes to fill the bath. Overall it is a very good hotel and the room was very quiet once the shutters were closed. Thank you for taking time to share this review! We look forward to welcome you soon!. 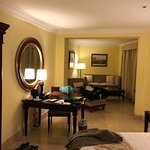 We are in Cuba on our honeymoon and booked a suite at the hotel paying over $350 per night for a room. We stopped by to get some advice from the concierge and the travel desk yesterday to plan our time here. The staff was surprisingly unhelpful. They bounced us from desk to desk and showed very little interest in helping, even as we waited around for multiple staff members to finish lunch. After just having stayed at the Taj Malabar in Kochi right before this the poor quality of hospitality here was starkly evident. We are not sure if this is the usual level of hospitality or something that is reserved for non-white guests. Either way - we will check in today because there is a 50% cancellation fee. But our fist brush with this hotel has left a sour taste in our mouths. Thank you for taking time to write about your experience with us. Although we have not fully met your expectations, we appreciate your valuable review and we want you keep in mind that we don't discriminate against anyone because of the color of their skin, so will take your comment very seriously, giving it the highest priority. The waiter in the mezzanine bar overcharged us for our drinks. We pointed it out but he wouldn’t accept his error. It wasn’t a lot but it’s the principle. Clearly this place rests on its laurels. Avoid. Thank you for taking time to write about your experience with us. Although we have not fully met your expectations, we appreciate your valuable review and we will take your comment very seriously, giving it the highest priority.